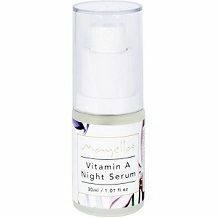 Mayella Vitamin A Night Serum is a product that is designed to reduce the signs of aging by repairing and renewing skin cells. It contains natural ingredients to help regenerate the skin so that it has a younger appearance. It also helps to hydrate the skin so that it is healthier. This review will assess the product to determine if this product, especially compared to others on the market, is the best option for customers. Vitamin A features as an important molecule during the cellular cycle that the skin uses to regenerate. It helps skin to produce a protein called collagen which is then placed between the skin cells and acts like a net that holds onto water and other biological molecules. This fills out the skin, making it plumper and reducing wrinkles. Vitamin A is also important to help the immune system of the skin which helps to protect the skin from infection and damage that could accelerate aging. Vitamin A is also an antioxidant. The Jasmine extract helps to hydrate the skin cells and the other two ingredients have natural antibiotic effects which also help to reduce infection of the skin. The product comes with a spray top. Shake the bottle before using it and then dispense one or two sprays of the product onto clean hands. Then apply the product to the whole face and neck by massaging it in an upward and circular motion, paying special attention to the affected areas. The product must only be used at night-time, once a day. This product must not be used during pregnancy. The prices are listed in US dollars, but customers in Australia can purchase the product with their local currency and pay using four interest free payments if they would like to. There is no guarantee for this product and the manufacturer only refunds a customer if the product that they ordered is faulty. The customer has 14 days if they live in Australia or 28 days if they live abroad to contact the manufacturer. They also offer an exchange for a different product if the one that arrived is faulty. Apart from that there are no returns. The lack of a guarantee on this product leads us to believe that the manufacturer is not fully confident in their product. This is because by not offering a guarantee they have shifted the risk of the product not working to the customer, who then has to face the consequences and lose money, even though it is not their fault. There are some very potent but natural ingredients in this product which are scientifically supported. The instructions for the product are simple to follow. The major problem with this product is that it is not protected by a guarantee so if it does not work for a customer then that customer is left with poor results and less money. There are products with proven effectiveness and a guarantee on the market and we believe these are better than this product.